Earlier this week we looked at how audiences responded both positively and negatively to this year’s lineup of Super Bowl ads. While a number of funny spots seemed to go over well with the public, a Dodge Ram ad prominently featuring a speech by Dr. Martin Luther King Jr. decidedly did not. After the commercial aired, thousands took to social media to condemn the company for stealing the words of such an admired humanitarian. Of course, these critics soon found out that Dodge didn’t steal anything: the automaker received full permission from the King Estate to use the speech in its ad. This incident shows just how tricky it can be to manage the image of a famous person once they’ve left the world of the living. In the case of Dr. King, a family-owned company called Intellectual Properties Management exclusively controls the rights to license his image. And while allowing his words to appear in a commercial was a rare occurrence, other licensing companies are far more willing to place deceased celebrities into ads. Marilyn Monroe, for instance, starred in a 2016 Super Bowl spot for Snickers despite being dead for more than 50 years. She has an enormous following on social media as well, amassing 260,000 followers on Twitter and more than 14 million likes on Facebook. Along with a Marilyn Monroe Snapchat filter that’s been used more than 300 million times, she’s also been rebooted in China as a popular cartoon character named Mini Marilyn. None of these things would have happened without Authentic Brands, a licensing firm that also holds image rights for Michael Jackson, Muhammad Ali and Elvis Presley. The company earns millions of dollars annually by keeping powerful brands like these in the public eye, which can be especially challenging after the individual has died. Still, there are certain advantages in dealing with dead celebrities. First of all, they’re no longer around to cause any new scandals or put on a bad performance. Plus, famous fallen performers often come with built-in audiences who pass on their passion to family members and friends. 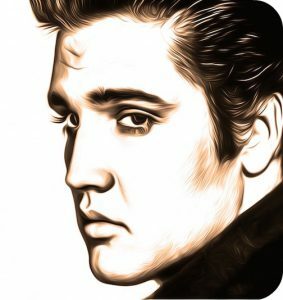 In the case of Elvis, Authentic Brands has banked on just this sort of intergenerational support with its $137 million makeover of Graceland, the King’s Memphis mansion. The hope is that fans both young and old will flock to the renovated estate and add even more revenue onto the $35 million that Elvis earned in 2017. Besides earning money, why do companies keep close control over the image rights of dead celebrities? Do you think it’s ethical to continue marketing a public figure like Marilyn Monroe or Elvis Presley after their death? Why or why not? Sources: April Glaser, “Yes, the Martin Luther King Jr. Estate Approved That Ram Trucks Super Bowl Ad,” Slate, February 4, 2018; Lauren Coleman-Lochner, “Moneyball for Dead Celebs: This $5 Billion Business Sells Elvis and Michael Jackson,” Bloomberg BusinessWeek, July 12, 2017; Zack O’Malley Greenburg, “The Top-Earning Dead Celebrities Of 2017,” Forbes, October 30, 2017.